A salon is a gathering of people under the roof of an inspiring host, held partly to amuse one another and partly to refine the taste and increase the knowledge of the participants through conversation. These gatherings often consciously followed Horace's definition of the aims of poetry, "either to please or to educate" (Latin: aut delectare aut prodesse). Salons in the tradition of the French literary and philosophical movements of the 17th and 18th centuries were carried on until as recently as the 1940s in urban settings. The salon was an Italian invention of the 16th century, which flourished in France throughout the 17th and 18th centuries. The salon continued to flourish in Italy throughout the 19th century. In 16th-century Italy, some brilliant circles formed in the smaller courts which resembled salons, often galvanized by the presence of a beautiful and educated patroness such as Isabella d'Este or Elisabetta Gonzaga. One important place for the exchange of ideas was the salon. The word salon first appeared in France in 1664 (from the Italian word salone, itself from sala, the large reception hall of Italian mansions). Literary gatherings before this were often referred to by using the name of the room in which they occurred, like cabinet, réduit, ruelle and alcôve. Before the end of the 17th century, these gatherings were frequently held in the bedroom (treated as a more private form of drawing room): a lady, reclining on her bed, would receive close friends who would sit on chairs or stools drawn around. This practice may be contrasted with the greater formalities of Louis XIV's petit lever, where all stood. Ruelle, literally meaning "narrow street" or "lane", designates the space between a bed and the wall in a bedroom; it was used commonly to designate the gatherings of the "précieuses", the intellectual and literary circles that formed around women in the first half of the 17th century. The first renowned salon in France was the Hôtel de Rambouillet not far from the Palais du Louvre in Paris, which its hostess, Roman-born Catherine de Vivonne, marquise de Rambouillet (1588–1665), ran from 1607 until her death. She established the rules of etiquette of the salon which resembled the earlier codes of Italian chivalry. Major historiographical debates focus on the relationship between the salons and the public sphere, as well as the role of women within the salons. A whole world of social arrangements and attitude supported the existence of French salons: an idle aristocracy, an ambitious middle class, an active intellectual life, the social density of a major urban center, sociable traditions, and a certain aristocratic feminism. This world did not disappear in 1789. In the 1920s, Gertrude Stein's Saturday evening salons (described in Ernest Hemingway's A Moveable Feast and depicted fictionally in Woody Allen's Midnight in Paris) gained notoriety for including Pablo Picasso and other twentieth-century luminaries like Alice B. Toklas. The content and form of the salon to some extent defines the character and historical importance of the salon. Contemporary literature about the salons is dominated by idealistic notions of politesse, civilité and honnêteté, but whether the salons lived up to these standards is matter of debate. Older texts on the salons tend to paint an idealistic picture of the salons, where reasoned debate takes precedence and salons are egalitarian spheres of polite conversation. Today, however, this view is rarely considered an adequate analysis of the salon. Dena Goodman claims that rather than being leisure based or 'schools of civilité' salons were instead at 'the very heart of the philosophic community' and thus integral to the process of Enlightenment. In short, Goodman argues, the 17th and 18th century saw the emergence of the academic, Enlightenment salons, which came out of the aristocratic 'schools of civilité'. Politeness, argues Goodman, took second-place to academic discussion. The period in which salons were dominant has been labeled the 'age of conversation'. The topics of conversation within the salons - that is, what was and was not 'polite' to talk about - are thus vital when trying to determine the form of the salons. The salonnières were expected, ideally, to run and moderate the conversation (See Women in the salon). There is, however, no universal agreement among historians as to what was and was not appropriate conversation. Marcel Proust 'insisted that politics was scrupulously avoided'. Others suggested that little other than government was ever discussed. The disagreements that surround the content of discussion partly explain why the salon's relationship with the public sphere is so heavily contested. Individuals and collections of individuals that have been of cultural significance overwhelmingly cite some form of engaged, explorative conversation regularly held with an esteemed group of acquaintances as the source of inspiration for their contributions to culture, art, literature and politics, leading some scholars to posit the salon's influence on the public sphere as being more widespread than previously appreciated. Recent historiography of the salons has been dominated by Jürgen Habermas' work, The Structural Transformation of the Public Sphere (triggered largely by its translation into French, in 1978, and then English, in 1989), which argued that the salons were of great historical importance. Theatres of conversation and exchange – such as the salons, and the coffeehouses in England – played a critical role in the emergence of what Habermas termed the public sphere, which emerged in cultural-political contrast to court society. Thus, while women retained a dominant role in the historiography of the salons, the salons received increasing amounts of study, much of it in direct response to, or heavily influenced by Habermas’ theory. The most prominent defence of salons as part of the public sphere comes from Dena Goodman’s The Republic of Letters, which claims that the ‘public sphere was structured by the salon, the press and other institutions of sociability’. Goodman’s work is also credited with further emphasising the importance of the salon in terms of French history, the Republic of Letters and the Enlightenment as a whole, and has dominated the historiography of the salons since its publication in 1994. Habermas’ dominance in salon historiography has come under criticism from some quarters, with Pekacz singling out Goodman’s Republic of Letters for particular criticism because it was written with ‘the explicit intention of supporting [Habermas’] thesis’, rather than verifying it. The theory itself, meanwhile, has been criticised for a fatal misunderstanding of the nature of salons. The main criticism of Habermas’ interpretation of the salons, however, is that the salons of most influence were not part of an oppositional public sphere, and were instead an extension of court society. This criticism stems largely from Norbert Elias’ The History of Manners, in which Elias contends that the dominant concepts of the salons – politesse, civilité and honnêteté – were ‘used almost as synonyms, by which the courtly people wished to designate, in a broad or narrow sense, the quality of their own behaviour’. Joan Landes agrees, stating that, ‘to some extent, the salon was merely an extension of the institutionalised court’ and that rather than being part of the public sphere, salons were in fact in conflict with it. Erica Harth concurs, pointing to the fact that the state ‘appropriated the informal academy and not the salon’ due to the academies’ ‘tradition of dissent’ – something that lacked in the salon. But Landes’ view of the salons as a whole is independent of both Elias’ and Habermas’ school of thought, insofar that she views the salons as a ‘unique institution’, that cannot be adequately described as part of the public sphere, or court society. Others, such as Steven Kale, compromise by declaring that the public and private spheres overlapped in the salons. Antoine Lilti ascribes to a similar viewpoint, describing the salons as simply ‘institutions within Parisian high society’. When dealing with the salons, historians have traditionally focused upon the role of women within them. Works in the 19th and much of the 20th centuries often focused on the scandals and ‘petty intrigues’ of the salons. Other works from this period focused on the more positive aspects of women in the salon. Indeed, according to Jolanta T. Pekacz, the fact women dominated history of the salons meant that study of the salons was often left to amateurs, while men concentrated on 'more important' (and masculine) areas of the Enlightenment. Historians tended to focus on individual salonnières, creating almost a 'great-woman' version of history that ran parallel to the Whiggish, male dominated history identified by Herbert Butterfield. Even in 1970, works were still being produced that concentrated only on individual stories, without analysing the effects of the salonnières' unique position. The integral role that women played within salons, as salonnières, began to receive greater - and more serious - study in latter parts of the 20th century, with the emergence of a distinctly feminist historiography. The salons, according to Carolyn Lougee, were distinguished by 'the very visible identification of women with salons', and the fact that they played a positive public role in French society. General texts on the Enlightenment, such as Daniel Roche's France in the Enlightenment tend to agree that women were dominant within the salons, but that their influence did not extend far outside of such venues. It was, however, Goodman’s The Republic of Letters that ignited a real debate surrounding the role of women within the salons and the Enlightenment as a whole. According to Goodman: ‘The salonnières were not social climbers but intelligent, self-educated, and educating women who adopted and implemented the values of the Enlightenment Republic of Letters and used them to reshape the salon to their own social intellectual, and educational needs’. Wealthy members of the aristocracy have always drawn to their court poets, writers and artists, usually with the lure of patronage, an aspect that sets the court apart from the salon. Another feature that distinguished the salon from the court was its absence of social hierarchy and its mixing of different social ranks and orders. In the 17th and 18th centuries, "salon[s] encouraged socializing between the sexes [and] brought nobles and bourgeois together". Salons helped facilitate the breaking down of social barriers which made the development of the enlightenment salon possible. In the 18th century, under the guidance of Madame Geoffrin, Mlle de Lespinasse, and Madame Necker, the salon was transformed into an institution of Enlightenment. 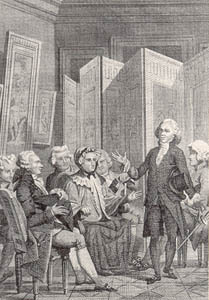 The enlightenment salon brought together Parisian society, the progressive philosophes who were producing the Encyclopédie, the Bluestockings and other intellectuals to discuss a variety of topics. At that time women had powerful influence over the salon. Women were the center of life in the salon and carried very important roles as regulators. They could select their guests and decide the subjects of their meetings. These subjects could be social, literary, or political topics of the time. They also served as mediators by directing the discussion. The salon was an informal education for women, where they were able to exchange ideas, receive and give criticism, read their own works and hear the works and ideas of other intellectuals. 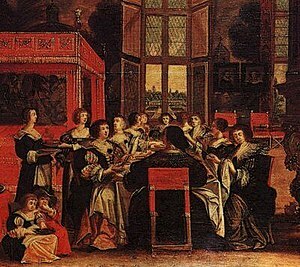 Many ambitious women used the salon to pursue a form of higher education. Two of the most famous 17th-century literary salons in Paris were the Hôtel de Rambouillet, established in 1607 near the Palais du Louvre by the marquise de Rambouillet, where gathered the original précieuses, and, in 1652 in Le Marais, the rival salon of Madeleine de Scudéry, a long time habituée of the Hôtel de Rambouillet. Les bas-bleus, borrowed from England's "blue-stockings," soon found itself in use upon the attending ladies, a nickname continuing to mean "intellectual woman" for the next three hundred years. Julie de Lespinasse: her chief draw was d'Alembert, but "though the name of M. d'Alembert may have drawn them thither, it was she alone who kept them there." Some 19th-century salons were more inclusive, verging on the raffish, and centered around painters and "literary lions" such as Madame Récamier. After the shock of the 1870 Franco-Prussian War, French aristocrats withdrew from the public eye. However, Princess Mathilde still held a salon in her mansion, rue de Courcelles, later rue de Berri. From the middle of the 19th century until the 1930s, a lady of society had to hold her "day", which meant that her salon was opened for visitors in the afternoon once a week, or twice a month. Days were announced in Le Bottin Mondain. The visitor gave his visit cards to the lackey or the maître d'hôtel, and he was accepted or not. Only people who had been introduced previously could enter the salon. Marcel Proust called up his own turn-of-the-century experience to recreate the rival salons of the fictional duchesse de Guermantes and Madame Verdurin. He experienced himself his first social life in salons such as Mme Arman de Caillavet's one, which mixed artists and political men around Anatole France or Paul Bourget; Mme Straus' one, where the cream of the aristocracy mingled with artists and writers; or more aristocratic salons like Comtesse de Chevigné's, Comtesse Greffulhe's, Comtesse Jean de Castellane's, Comtesse Aimery de La Rochefoucauld's, etc. Some late 19th- and early 20th-century Paris salons were major centres for contemporary music, including those of Winnaretta Singer (the princesse de Polignac), and Élisabeth, comtesse Greffulhe. They were responsible for commissioning some of the greatest songs and chamber music works of Fauré, Debussy, Ravel and Poulenc. Until the 1950s, some salons were held by ladies mixing political men and intellectuals during the IVth Republic, like Mme Abrami, or Mme Dujarric de La Rivière. The last salons in Paris were those of Marie-Laure de Noailles, with Jean Cocteau, Igor Markevitch, Salvador Dalí, etc., Marie-Blanche de Polignac (Jeanne Lanvin's daughter) and Madeleine and Robert Perrier, with Josephine Baker, Le Corbusier, Django Reinhardt, etc. Salon sociability quickly spread through Europe. In the 18th and 19th centuries, many large cities in Europe held salons along the lines of the Parisian models. Prior to the formation of Belgium, Béatrix de Cusance hosted a salon in Brussels in what was then the Spanish Netherlands in the mid 17th-century. In the late 18th-century, the political salon of Anne d'Yves played a role in the Brabant Revolution of 1789. In Belgium, the 19th century salon hosted by Constance Trotti attracted cultural figures, the Belgian aristocracy and members of the French exiled colony. In Denmark, the salon culture was adopted during the 18th century. Christine Sophie Holstein and Charlotte Schimmelman were the most notable hostesses, in the beginning and in the end of the 18th century respectively, both of whom were credited with political influence. During the Danish Golden Age in the late 18th century and early 19th century, the literary salon played a significant part in Danish culture life, notably the literary salons arranged by Friederike Brun at Sophienholm and that of Kamma Rahbek at Bakkehuset. In Germany, the most famous were held by Jewish ladies, such as Henriette Herz, Sara Grotthuis, and Rahel Varnhagen, and in Austria in the late 18th and early 19th centuries by two prominent Jewish Patrons of the Arts: Adele Bloch-Bauer and Berta Zuckerkandl. In Spain, by María del Pilar Teresa Cayetana de Silva y Álvarez de Toledo, 13th Duchess of Alba at the end of the 18th century; and in Greece by Alexandra Mavrokordatou in the 17th century. Increasingly emancipated German-speaking Jews wanted to immerse themselves in Germany's rich cultural life. However, individual Jews were faced with a dilemma: they faced new opportunities, but without the comfort of a secure community. For Jewish women, there was an additional issue. German society imposed the usual gender role restrictions and antisemitism, so cultivated Jewish women tapped into the cultural salon. But from 1800 on, salons performed a political and social miracle. The salon allowed Jewish women to establish a venue in their homes in which Jews and non-Jews could meet in relative equality. Like-minded people could study art, literature, philosophy or music together. This handful of educated, acculturated Jewish women could escape the restrictions of their social ghetto. Naturally the women had to be in well-connected families, either to money or to culture. In these mixed gatherings of nobles, high civil servants, writers, philosophers and artists, Jewish salonnières created a radical vehicle for democratisation, providing a context in which patrons and artists freely exchanged ideas. Henriette Lemos Herz, Fanny Mendelssohn Hensel, Dorothea Mendelssohn Schlegel, Amalie Wolf Beer and at least twelve other salonnières achieved fame and admiration. In 18th century England, salons were held by Elizabeth Montagu, in whose salon the expression bluestocking originated, and who created the Blue Stockings Society, and by Hester Thrale. In the 19th century, the Russian Baroness Méry von Bruiningk hosted a salon in St. John's Wood, London, for refugees (mostly German) of the revolutions of 1848 (the Forty-Eighters). Clementia Taylor, an early feminist and radical held a salon at Aubrey House in Campden Hill in the 1860s. Her salon was attended by Moncure D. Conway, Louisa May Alcott, Arthur Munby, feminists Barbara Bodichon, Lydia Becker, Elizabeth Blackwell, and Elizabeth Malleson. Holland House in Kensington under the Fox family in the late 18th and early 19th centuries was akin to a French salon, largely for adherents to the Whig Party. Italy had had an early tradition of the salon; Giovanna Dandolo became known as a patron and gatherer of artists as wife of Pasquale Malipiero, the doge in Venice in 1457-1462, and the courtisan Tullia d'Aragona held a salon already in the 16th century, and in the 17th century Rome, the abdicated Queen Christina of Sweden and the princess Colonna, Marie Mancini, rivaled as salon hostesses. In the 18th century, Aurora Sanseverino provided a forum for poets, artists, and musicians in Naples, making her a central figure in baroque Italy. The tradition of the literary salon continued to flourish in Italy throughout the 19th century. Naturally there were many salons with some of the most prominent being hosted by Clara Maffei in Milan, Emilia Peruzzi in Florence and Olimpia Rossi Savio in Turin. The salons attracted countless outstanding 19th-century figures including the romantic painter Francesco Hayez, composer Giuseppe Verdi and naturalist writers Giovanni Verga, Bruno Sperani and Matilde Serao. The salons served a very important function in 19th-century Italy, as they allowed young attendees to come into contact with more established figures. They also served as a method of avoiding government censorship, as a public discussion could be held in private. The golden age of the salon in Italy could be said to coincide with the pre-unification period, after which the rise of the newspaper replaced the salon as the main place for the Italian public to engage in conversation. Argentina's most active female figure in the revolutionary process, Mariquita Sánchez, was Buenos Aires' leading salonnière. She fervently embraced the cause of revolution, and her tertulia gathered all the leading personalities of her time. The most sensitive issues were discussed there, as well as literary topics. Mariquita Sánchez is widely remembered in the Argentine historical tradition because the Argentine National Anthem was sung for the first time in her house, on 14 May 1813. In Poland, the duchess Sieniawska held a salon in the end of the 17th century. They became very popular there during the 18th century. The most renowned were the Thursday Dinners of King Stanisław II Augustus at the end of the 18th century, and the most notable salonnières were Zofia Lubomirska and Izabela Czartoryska, both of whom were patrons of the famous Polish composer Frederic Chopin. The salon culture was introduced to Imperial Russia during the Westernization Francophile culture of the Russian aristocracy in the 18th-century. During the 19th-century, several famous salon functioned hosted by the nobility in Saint Petersburg and Moscow, among the most famed being the literary salon of Zinaida Volkonskaya in 1820s Moscow. In Sweden, the salon developed during the late 17th century and flourished until the late 19th century. During the 1680s and 1690s, the salon of countess Magdalena Stenbock became a meeting where foreign ambassadors in Stockholm came to make contacts, and her gambling table was described as a center of Swedish foreign policy. During the Swedish age of liberty (1718-1772), women participated in political debate and promoted their favorites in the struggle between the Caps (party) and the Hats (party) through political salons. These forums were regarded influential enough for foreign powers to engage some of these women as agents to benefit their interests in Swedish politics. The arguably most noted political salonniére of the Swedish age of liberty was countess Hedvig Catharina De la Gardie (1695–1745), whose salon has some time been referred to as the first in Sweden, and whose influence on state affairs exposed her to libelous pamphlets and made her a target of Olof von Dahlin's libelous caricature of the political salon hostess in 1733. Magdalena Elisabeth Rahm was attributed to have contributed to the realization of the Russo-Swedish War (1741–1743) through the campaign for the war she launched in her salon. Outside of politics, Hedvig Charlotta Nordenflycht acted as the hostess of the literary academy Tankebyggarorden and Anna Maria Lenngren did the same for the Royal Swedish Academy. During the reign of Gustavian age, the home of Anna Charlotta Schröderheim came to be known as a center of opposition. Salon hostesses were still attributed influence in politic affairs in the first half of the 19th century, which was said of both Aurora Wilhelmina Koskull in the 1820s as well as Ulla De Geer in the 1840s. In the 19th century, however, the leading salon hostesses in Sweden became more noted as the benefactors of the arts and charity than with politics. From 1820 and two decades onward, Malla Silfverstolpe became famous for her Friday nights salon in Uppsala, which became a center of the Romantic era in Sweden and, arguably the most famed literary salon in Sweden. During the 1860s and 1870s, the Limnell Salon of the rich benefactor Fredrika Limnell in Stockholm came to be a famous center of the Swedish cultural elite, were especially writers gathered to make contact with wealthy benefactors, a role which was eventually taken over by the Curman Receptions of Calla Curman in the 1880s and 1890s. In Iberia or Latin America, a tertulia is a social gathering with literary or artistic overtones. The word is originally Spanish and has only moderate currency in English, in describing Latin cultural contexts. Since the 20th century, a typical tertulia has moved out from the private drawing-room to become a regularly scheduled event in a public place such as a bar, although some tertulias are still held in more private spaces. Participants may share their recent creations (poetry, short stories, other writings, even artwork or songs). In Switzerland, the salon culture was extant in the mid 18th-century, represented by Julie Bondeli in Bern and Barbara Schulthess in Zürich, and the salon of Anna Maria Rüttimann-Meyer von Schauensee reached in influential role in the early 19th-century. In Coppet close to Geneva, the author Germaine de Staël hosted a salon which played a key role in the aftermath of the French Revolution and especially under Napoleon Bonaparte's Regime. De Staël is author of around thirty publication, from which De L'allemagne (1813) was the most well-known in its time. She has been painted by such famous painters as François Gérard and Elisabeth Vigée-Lebrun. Martha Washington, the first U.S. First Lady, performed a function similar to the host or hostess of the European salon. She held weekly public receptions throughout her husband's eight-year presidency (1789–1797). At these gatherings, members of Congress, visiting foreign dignitaries, and ordinary citizens alike were received at the executive mansion. More recently, "society hostesses" such as Perle Mesta have done so as well. The Stettheimer sisters, including the artist Florine Stettheimer, hosted gatherings at their New York City home in the 1920s and '30s. During the Harlem Renaissance, Ruth Logan Roberts, Georgia Douglas Johnson and Zora Neale Hurston hosted salons that brought together leading figures in African-American literature, and in the culture and politics of Harlem at the time. Pin Drop Studio - modern-day salon set in unusual venues in London, Paris, New York & Los Angeles. Simon Oldfield hosting in London. Modern-day versions of the traditional salon (some with a literary focus, and others exploring other disciplines in the arts and sciences) are held throughout the world, in private homes and public venues. One example is Pin Drop Studio in London, which hosts salons, open-invitation gatherings at cultural institutions such The Royal Academy of Arts, BAFTA, The British Institute, Dr Johnson's House and other cultural venues in London and other cities around the world, hosted by Pin Drop co-founder Simon Oldfield. The word salon also refers to art exhibitions. The Paris Salon was originally an officially sanctioned exhibit of recent works of painting and sculpture by members of the Académie royale de peinture et de sculpture, starting in 1673 and soon moving from the Salon Carré of the Palace of the Louvre. The name salon remained, even when other quarters were found and the exhibits' irregular intervals became biennial. A jury system of selection was introduced in 1748, and the salon remained a major annual event even after the government withdrew official sponsorship in 1881. ^ Aronson, Nicole, Madame de Rambouillet ou la magicienne de la Chambre bleue, Fayard, Paris, 1988. ^ Dena Goodman, The Republic of Letters: A Cultural History of the French Enlightenment (Ithaca: Cornell University Press, 1994), p. 280. ^ Steven Kale, French Salons, p. 5. ^ Kale, French Salons, p. 5. ^ a b Dena Goodman, The Republic of Letters: a Cultural History of the French Enlightenment (Ithaca: Cornell University Press, 1994), p. 14. ^ a b Jürgen Habermas (trans. Thomas Burger), The Structural Transformation of the Public Sphere: An Inquiry into a Category of Bourgeois Society (Camb., Mass. : MIT Press, 1989). ^ Joan B. Landes, Women and the Public Sphere in the Age of the French Revolution (Ithaca: Cornell University Press, 1988); Goodman, The Republic of Letters; Erica Harth, Cartesian Women: Versions and Subversions of Rational Discourse in the Old Regime (Ithaca: Cornell University Press, 1992). ^ Kale, French Salons, p. 238 n. 5. ^ Jolanta T. Pekacz, Conservative Tradition In Pre-Revolutionary France: Parisian Salon Women (New York: Peter Lang, 1999) p. 3. ^ Landes, Women and the Public Sphere in the Age of the French Revolution, pp. 23-4. ^ Norbert Elias (Trans. Edmund Jephcott), The Civilising Process: The History of Manners, Vol. 1 (Oxford: Basil Blackwell, 1978), pp. 39-40. ^ Landes, Women and the Public Sphere in the Age of the French Revolution, pp. 23-5. ^ Harth, Cartesian Women, pp. 61-63. ^ Kale, French Salons, p. 12. ^ Antoine Lilti, ‘Sociabilité et mondanité: Les hommes de lettres dans les salons parisiens au XVIIIe siècle’ French Historical Studies, Vol. 28, No. 3 (Summer 2005), p. 417. ^ Jolanta T. Pekacz, Conservative Tradition In Pre-Revolutionary France: Parisian Salon Women, p. 1. ^ S. G. Tallentyre, Women of the Salons (New York: G. P. Putnam’s Sons, 1926) and Julia Kavanagh, Women in France during the Enlightenment Century, 2 Vols (New York: G. P. Putnam’s Sons, 1893). ^ Edmond et Jules Goncourt, La femme au dix-huitème siècle (Paris: Firmin Didot, 1862) and Paul Deschanel, Figures des femmes (Paris: Calmann-Lévy, 1900). ^ Pekacz, Conservative Tradition In Pre-Revolutionary France, p. 2. ^ Carolyn C. Lougee, Women, Salons and Social Stratification in Seventeenth Century France, pp. 3-7. ^ Ibid., pp. 3, 7. ^ Daniel Roche (Trans Arthur Goldhammr), France in the Enlightenment, (Cambridge, Massachusetts: HUP, 1998), pp. 443-8. ^ Goodman, The Republic of Letters, pp. 1-11. ^ Django Reinhardt - Swing De Paris. 6 Oct. 2012. Exhibit. La Cité de la musique, Paris. ^ York, Neue Galerie New. "Neue Galerie New York". neuegalerie.org. Archived from the original on 18 October 2017. Retrieved 27 April 2018. ^ Webberley, Helen, "Cultural Salons and Jewish Women in 19th Century Berlin", Limmud Oz Conference Sydney, July 2005. ^ Moncure Daniel Conway (June 2001). Autobiography Memories and Experiences of Moncure Daniel Conway. Volume 2. Elibron.com. pp. 14–. ISBN 978-1-4021-6692-1. Retrieved 1 December 2012. ^ Romani, Gabriela. "A room with a view: interpreting the Ottocento through the literary salon". Retrieved 16 April 2012. ^ Soledad Vallejos (July 16, 2004). "Recuperando a Mariquita". Perfil. Archived from the original on May 14, 2014. Retrieved February 10, 2013. ^ Galasso, Norberto (2000). Seamos libres y lo demás no importa nada [Let us be free and nothing else matters] (in Spanish). Buenos Aires: Colihue. p. 102. ISBN 978-950-581-779-5. ^ C Fredrika Limnell, urn:sbl:10390, Svenskt biografiskt lexikon (art av Sven Erik Täckmark), hämtad 2015-03-15. ^ Calla Curman (f. Lundström), urn:sbl:15740, Svenskt biografiskt lexikon (art av Gurli Linder. ), hämtad 2015-09-05. ^ "The First First Lady". George Washington's Mount Vernon. Retrieved July 7, 2018. ^ Alexander, Adele Logan. "Roberts, Ruth Logan". Religion and Community. Facts On File, 1997. African-American History Online. Retrieved 6 February 2016. Sourced from Hine, Darlene Clark; Thompson, Kathleen, eds. (1997). Facts on File encyclopedia of Black women in America. New York, NY: Facts on File. ISBN 9780816034246. OCLC 906768602. ^ Murphy, Brenda (1999-06-28). The Cambridge Companion to American Women Playwrights. Cambridge University Press. ISBN 9780521576802. ^ "Salons Around the World | Intellectual Gatherings & Discussion". Four Seasons Magazine. 2015-01-08. Retrieved 2019-03-24. ^ Baker, Sam (2014-05-18). "The irresistible rise of the short story and salon society". ISSN 0307-1235. Archived from the original on 2018-03-11. Retrieved 2018-03-10. ^ "Live | Pin Drop". Pin Drop. Retrieved 2018-05-02. Harth, Erica, Cartesian Women: Versions and Subversions of Rational Discourse in the Old Regime (Ithaca: Cornell University Press, 1992). Beasley, Faith E. Salons, History, and the Creation of Seventeenth-Century France. Hampshire: Ashgate Publishing Company,2006. Bilski, Emily et al. Jewish Women and Their Salons: The Power of Conversation, Jewish Museum New York, 2005. Craveri, Benedetta. The Age of Conversation. Trans. Teresa Waugh. New York: New York Review Books,2005. Benet Davetian "The History and Meaning of Salons"
James Ross, ‘Music in the French Salon’; in Caroline Potter and Richard Langham Smith (eds. ), French Music Since Berlioz (Ashgate Press, 2006), pp. 91–115. ISBN 0-7546-0282-6. Mainardi, Patricia. The End of the Salon: Art and the State of the Early Republic. New York: Cambridge University Press, 1993. Laure HILLERIN, La comtesse Greffulhe, L'ombre des Guermantes Paris, Flammarion, 2014. Look up salon in Wiktionary, the free dictionary. Julie de Lespinasse, Mme Geoffrin in memoirs. Comic art: The Paris Salon in Caricature: Getty Museum exhibition, 2003.